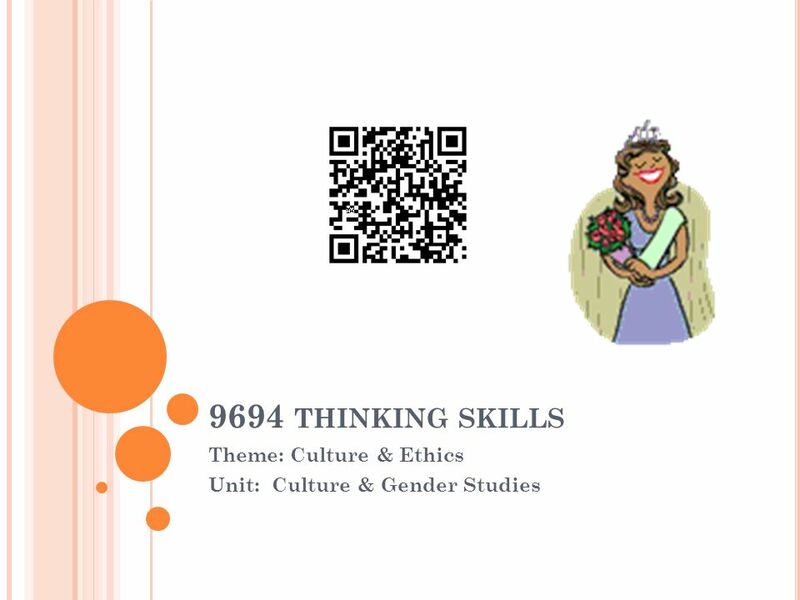 9694 THINKING SKILLS Theme: Culture & Ethics Unit: Culture & Gender Studies. 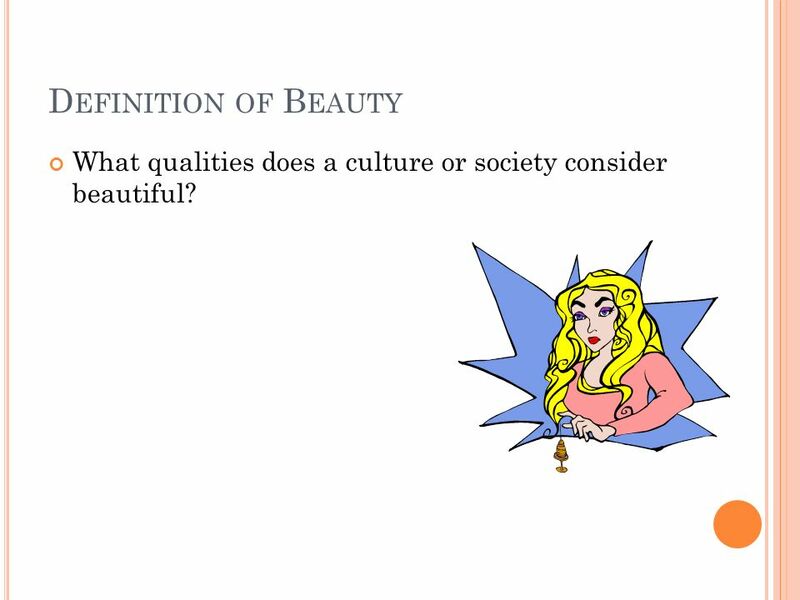 2 D EFINITION OF B EAUTY What qualities does a culture or society consider beautiful? 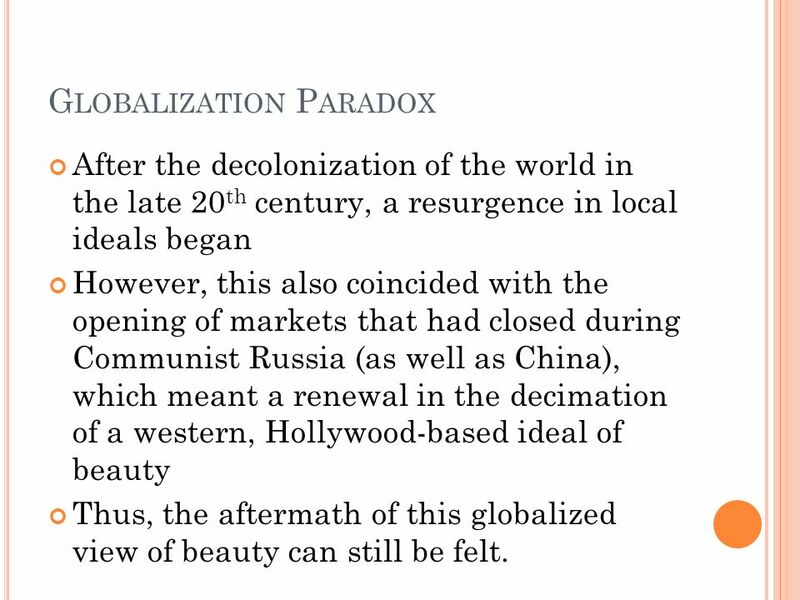 8 G LOBALIZATION P ARADOX After the decolonization of the world in the late 20 th century, a resurgence in local ideals began However, this also coincided with the opening of markets that had closed during Communist Russia (as well as China), which meant a renewal in the decimation of a western, Hollywood-based ideal of beauty Thus, the aftermath of this globalized view of beauty can still be felt. 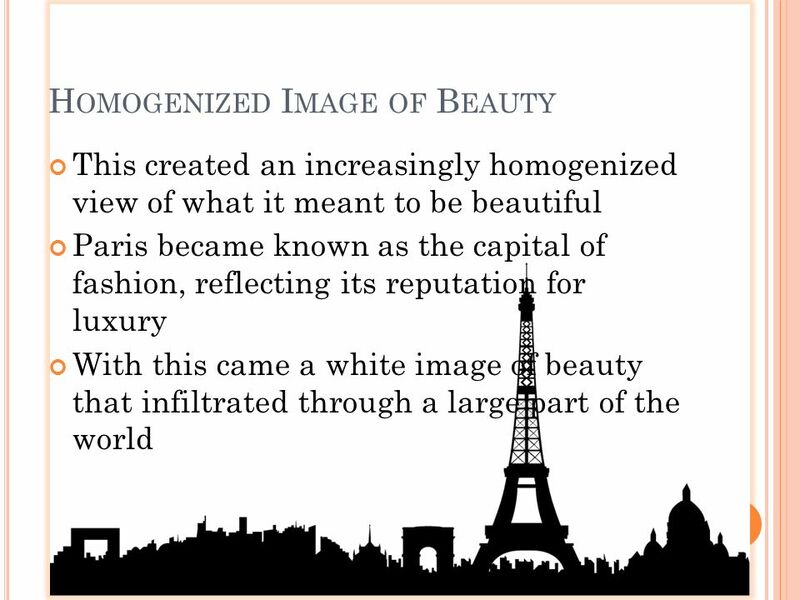 9 G LOBAL B EAUTY T RENDS I NTRO Clearly, beauty is a human obsession, one that spans cultures and centuries. 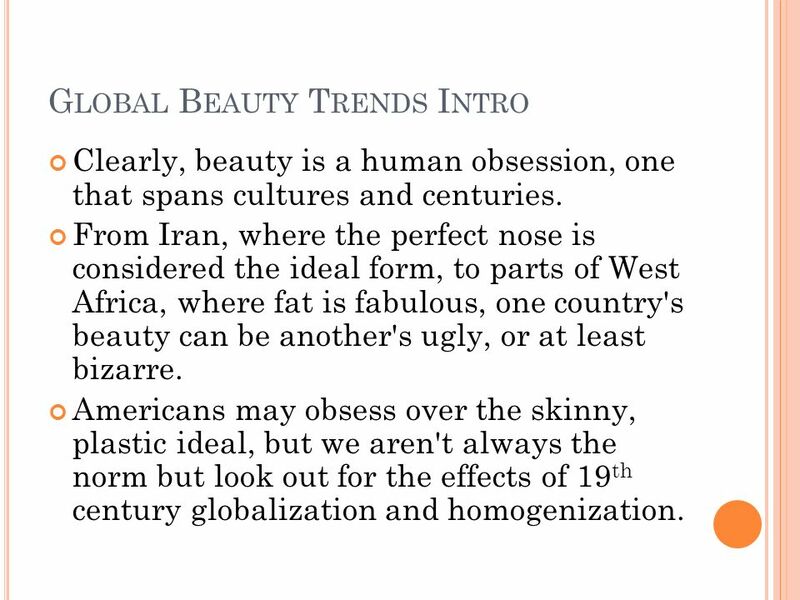 From Iran, where the perfect nose is considered the ideal form, to parts of West Africa, where fat is fabulous, one country's beauty can be another's ugly, or at least bizarre. 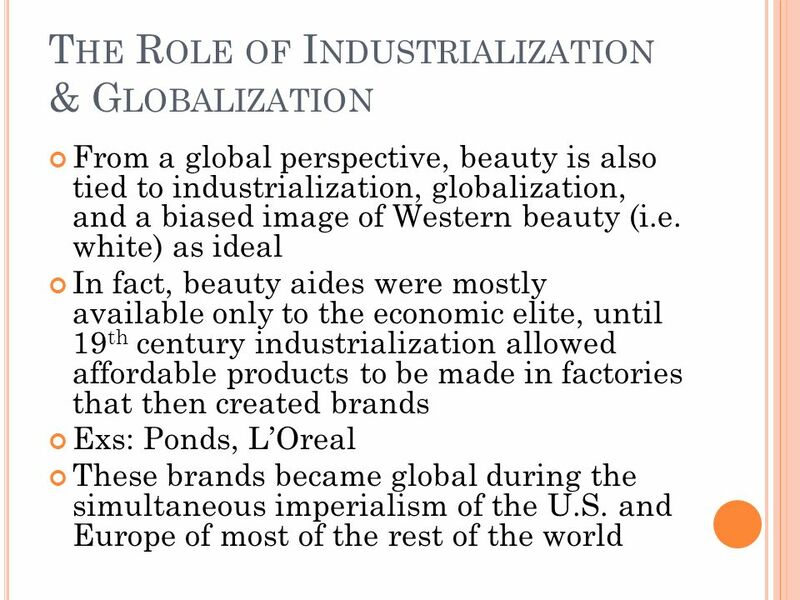 Americans may obsess over the skinny, plastic ideal, but we aren't always the norm but look out for the effects of 19 th century globalization and homogenization. 10 I RAN Both Iranian men and women embrace rhinoplasty as a display of status and beauty. Iran is now known as the nose-job capital of the world. 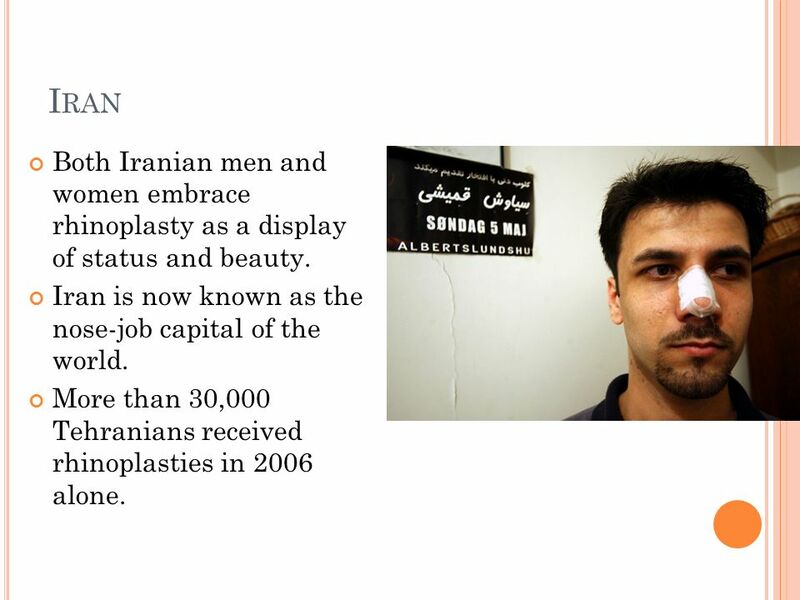 More than 30,000 Tehranians received rhinoplasties in 2006 alone. 11 S OUTHEAST A SIA Pale is the ideal and is associated with wealth, beauty, and social class. 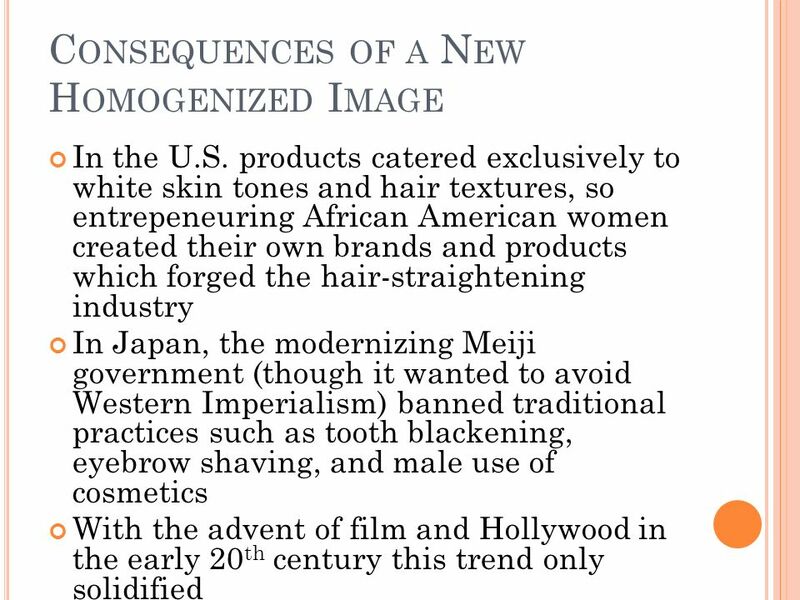 Over the past decade the white skin often seen in American beauty magazines has been aggressively marketed. In Thailand, for example, it's hard to find skin cosmetics that don't contain a whitening agent. 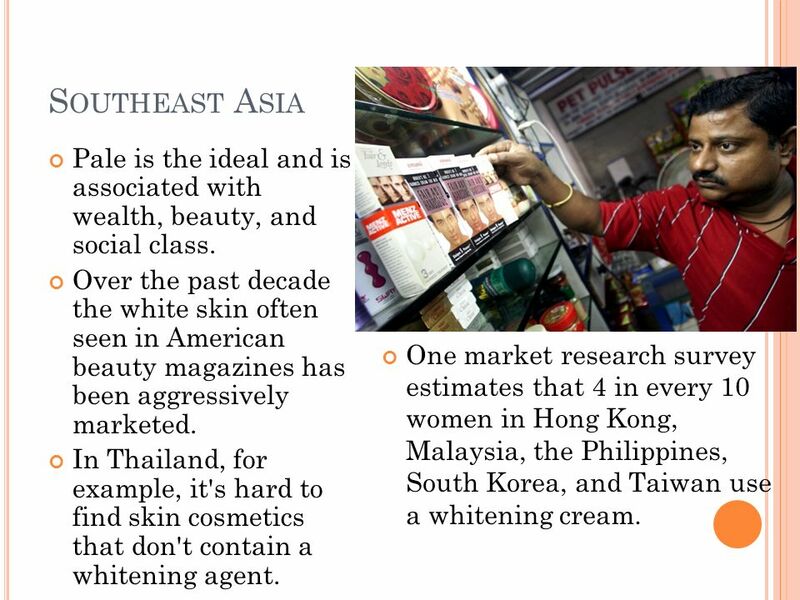 One market research survey estimates that 4 in every 10 women in Hong Kong, Malaysia, the Philippines, South Korea, and Taiwan use a whitening cream. 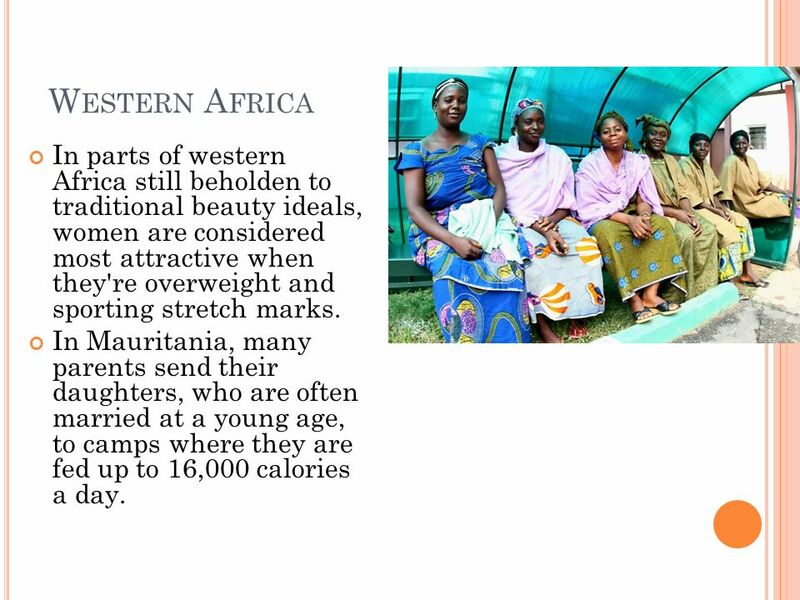 13 W ESTERN A FRICA In parts of western Africa still beholden to traditional beauty ideals, women are considered most attractive when they're overweight and sporting stretch marks. In Mauritania, many parents send their daughters, who are often married at a young age, to camps where they are fed up to 16,000 calories a day. 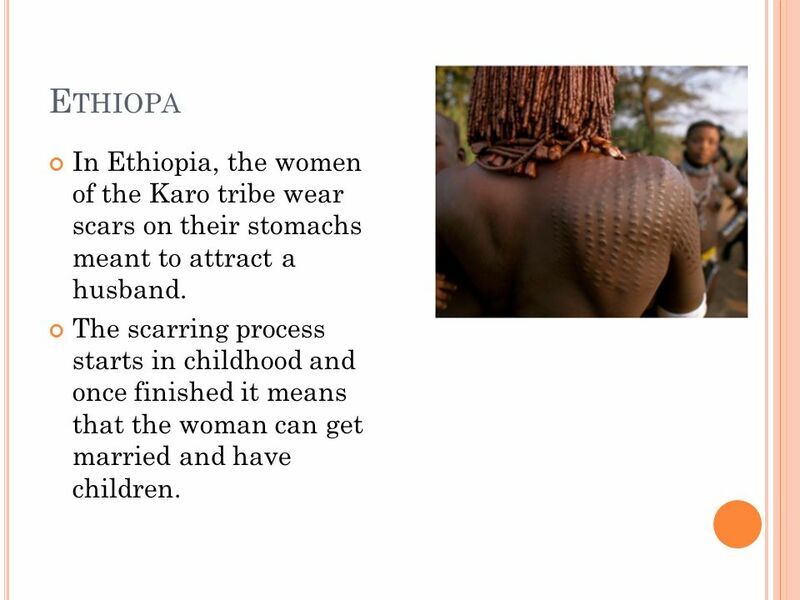 15 E THIOPA In Ethiopia, the women of the Karo tribe wear scars on their stomachs meant to attract a husband. The scarring process starts in childhood and once finished it means that the woman can get married and have children. 16 B RAZIL Although revered as a land where women have a beautiful curvaceous figure, a new trend towards slim body has been made manifest. 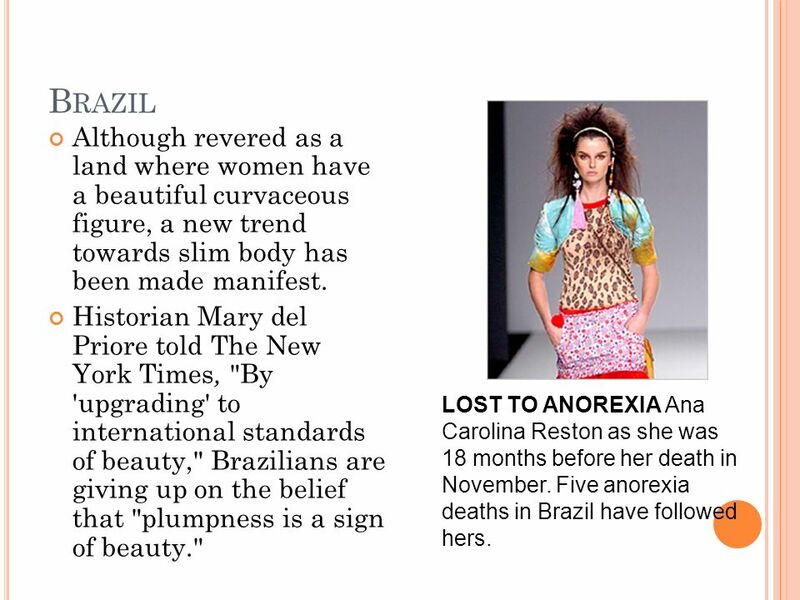 Historian Mary del Priore told The New York Times, "By 'upgrading' to international standards of beauty," Brazilians are giving up on the belief that "plumpness is a sign of beauty." LOST TO ANOREXIA Ana Carolina Reston as she was 18 months before her death in November. Five anorexia deaths in Brazil have followed hers. 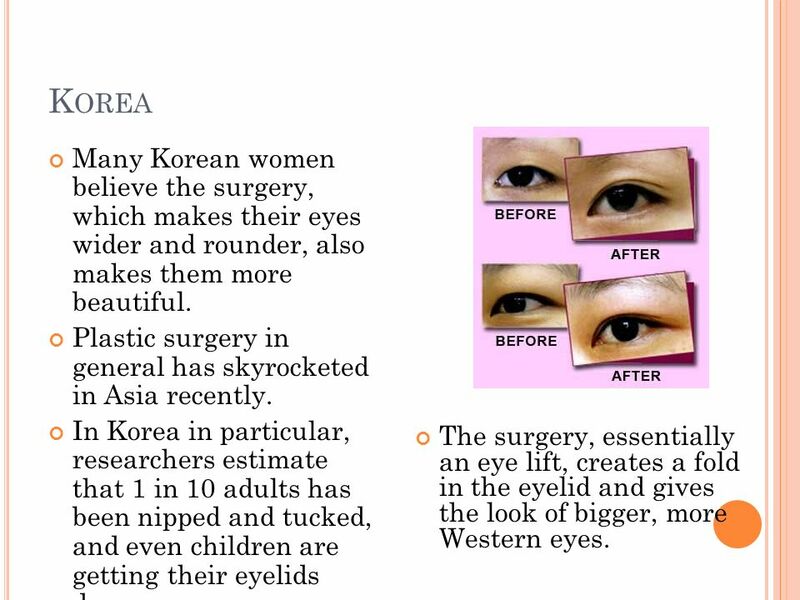 17 K OREA Many Korean women believe the surgery, which makes their eyes wider and rounder, also makes them more beautiful. Plastic surgery in general has skyrocketed in Asia recently. In Korea in particular, researchers estimate that 1 in 10 adults has been nipped and tucked, and even children are getting their eyelids done. The surgery, essentially an eye lift, creates a fold in the eyelid and gives the look of bigger, more Western eyes. 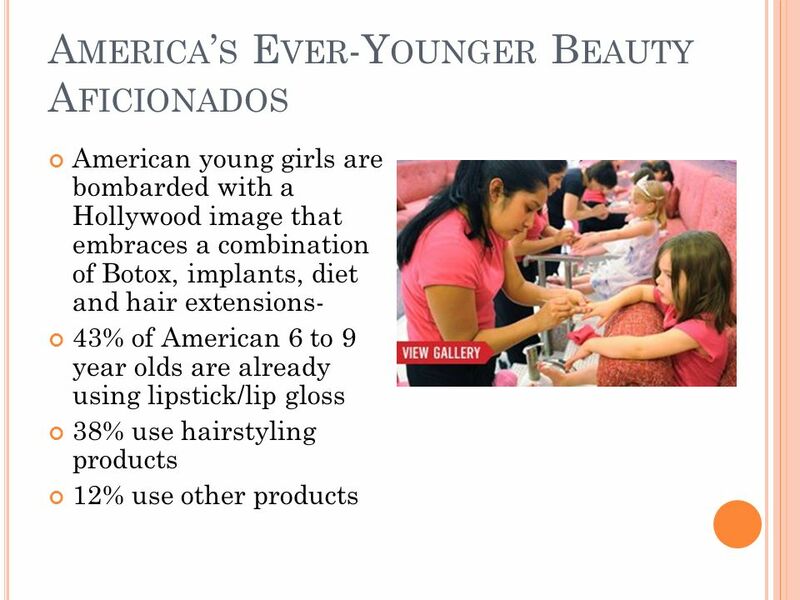 18 E UROPE In parts of Europe, including France, it's the natural look that's considered most "It really astonishes me the way American women wear so much makeup," Laura Mercier, the French creator of the cosmetics line told The New York Times. 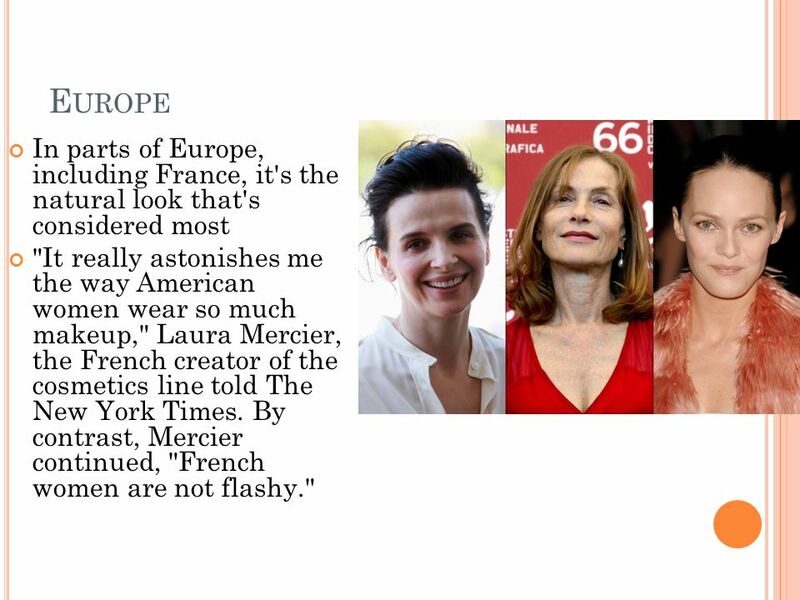 By contrast, Mercier continued, "French women are not flashy." 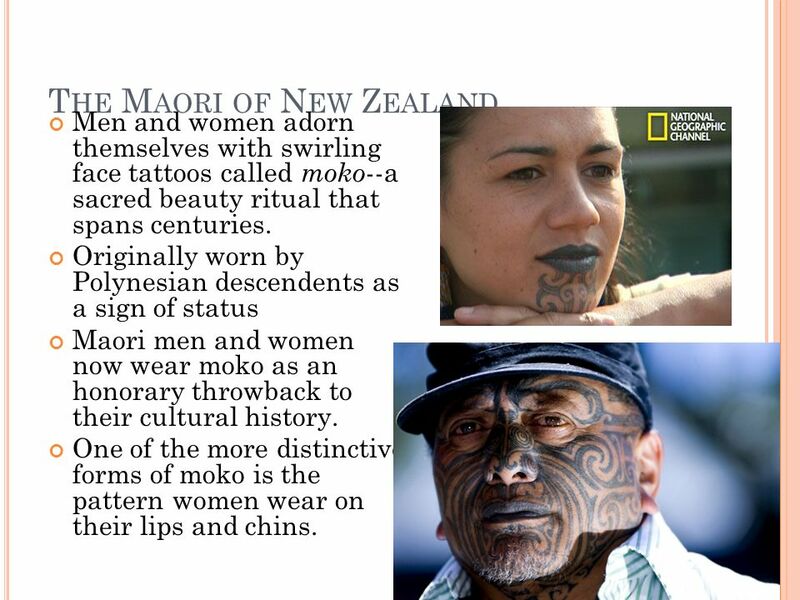 19 T HE M AORI OF N EW Z EALAND Men and women adorn themselves with swirling face tattoos called moko --a sacred beauty ritual that spans centuries. Originally worn by Polynesian descendents as a sign of status Maori men and women now wear moko as an honorary throwback to their cultural history. 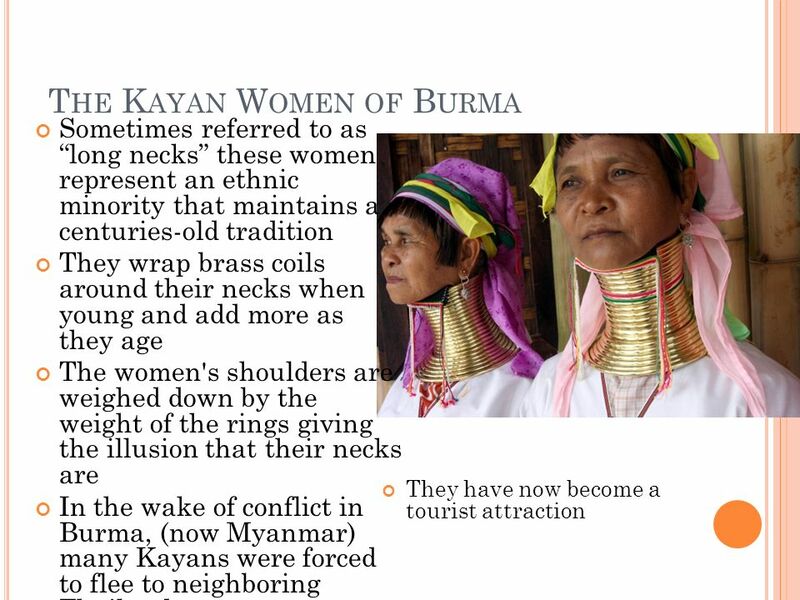 One of the more distinctive forms of moko is the pattern women wear on their lips and chins. 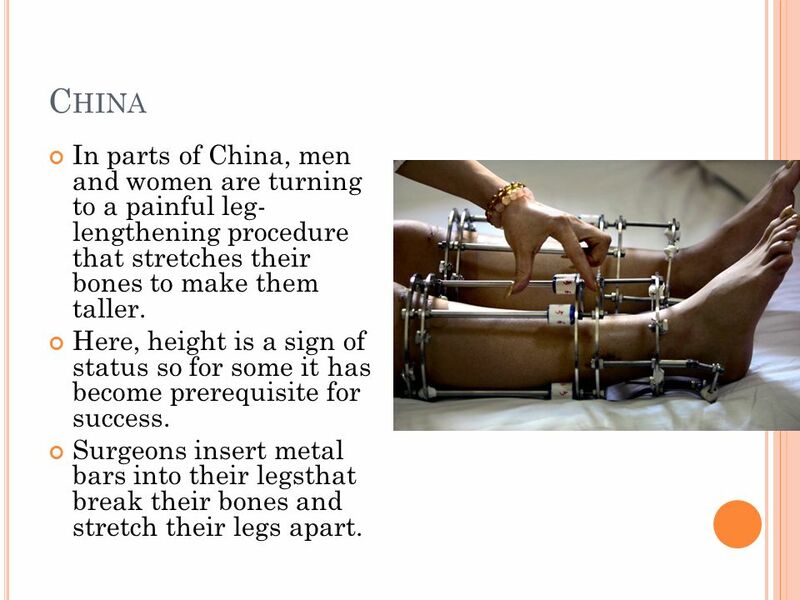 20 C HINA In parts of China, men and women are turning to a painful leg- lengthening procedure that stretches their bones to make them taller. Here, height is a sign of status so for some it has become prerequisite for success. Surgeons insert metal bars into their legsthat break their bones and stretch their legs apart. 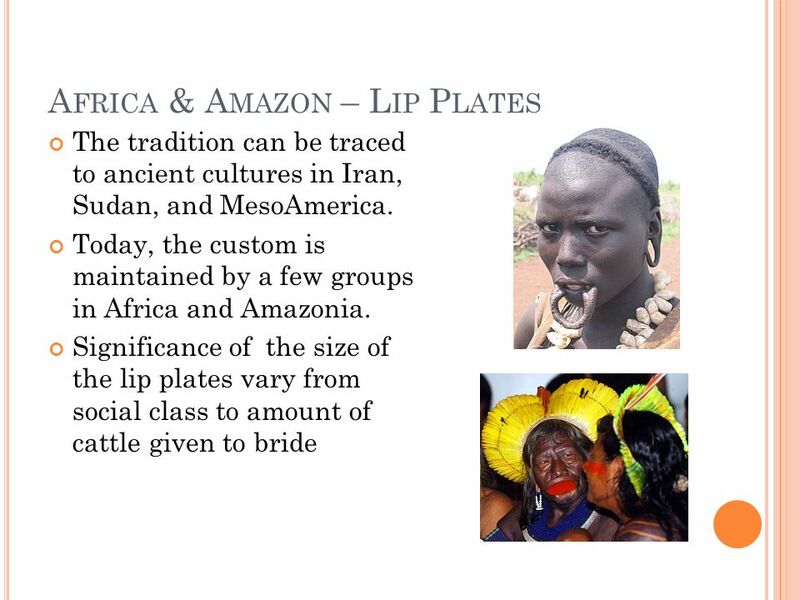 Download ppt "9694 THINKING SKILLS Theme: Culture & Ethics Unit: Culture & Gender Studies." Body Image & Gender Representation APPRECIATION PART II. The Body as Art in Africa Africa, a continent three times the size of the United States, is a land of incredible cultural diversity. Body art, either through. 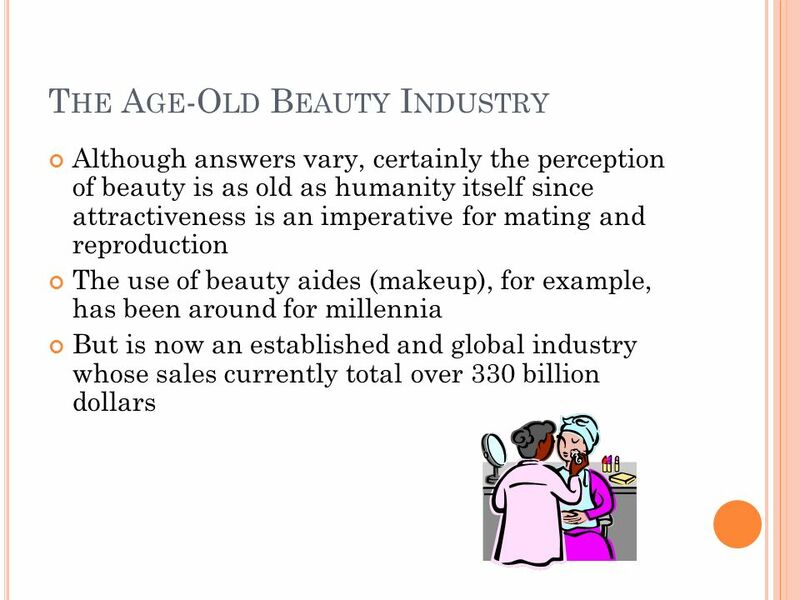 Are the ideals of beauty the same for everyone (Universalism)? 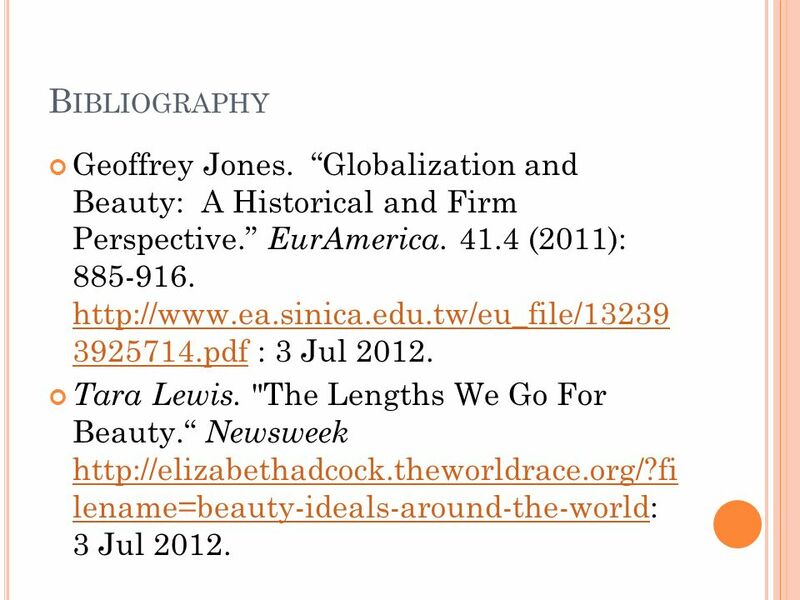 Beauty, Family, and Household Kinship Relations and the Cultural Differences of Beauty. Reading: You Are Gorgeous! ---- Read by understanding the logical relation in the context Ruan Huijian from Wenling High School. Beauty A multicultural look at what makes people beautiful. Sizing Up The Media: Decoding the Messages Presented by: Leta Marchand BSW, RSW Bulimia Anorexia Nervosa Association Windsor, ON. Tourism is one of the major industries for many Asian countries, attracting sometimes much-needed foreign exchange Stimulating economic development in. Media and Eating Disorders Sonia Valencia Research Methods ITT Technical Institute Instructor Kenneth Frawley. 1920’s: The Flappers By Callie Richards. 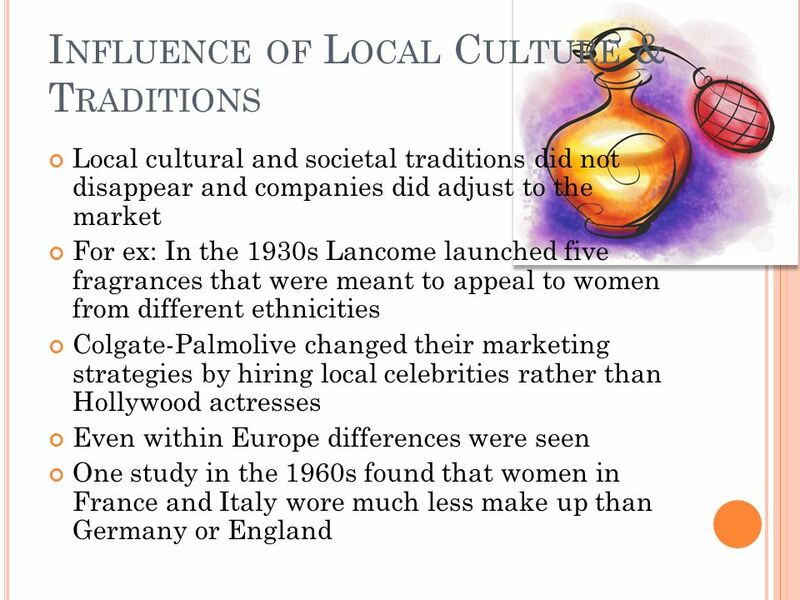 Women in the early 20 th Century Social norms for women were to maintain the home and children while the men.